Air Suspension Repair for your car in Al-Quoz! Get back to riding on a cloud with Deutsche Technik, without breaking the bank. You’ve seen them before. Dubai’s luxury cars slammed to the ground or tilted to one side, parked on the side of the road in Al-Qouz collecting dust. Why? You ask. The answer is that their air suspension system has failed, and repairing these systems can be an expensive and daunting task. Dealerships will often needlessly replace expensive components until the problem is gone and the customer is faced with a repair bill that would put a dent in the US deficit. Luckily for us, the UAE has responded in full force to the air suspension epidemic with Dubai’s Deutsche Technik (DT), your leading specialist on all things air suspension. Whether you drive an Audi, Volkswagen, Mercedes, Porsche, or Bentley, DT has seen your air suspension problem before and we can fix it. DT’s extensive experience and expertise in air suspension systems means we have a targeted diagnostic approach that pinpoints the problem and repairs it without having to needlessly replace expensive components. We employ a multitude of diagnostic softwares and diagnostic techniques to provide our customers with a cost efficient and reliable solution to any air suspension problem. The idea behind pneumatic suspension or air suspension has been around since 1901, nearly as long as the automobile itself. You could argue that Aladdin’s magic carpet was the first form of transportation to ride on air but we live in “a whole new world”. The technology that allowed the idea to become a reality didn’t come until 1920 when a Frenchman sought to “hold the car aloft on four gas bubbles”. Fast forward another 20 years and you find yourself in World War 2 when the Americans began using air suspension in heavy trucks to attain self-leveling suspension that could behave independently from varying vehicle loads. Today, air suspension is commonly found in luxury passenger vehicles to provide exceptional ride quality, simple self-leveling capability, consistent handling characteristics independent of load, and to change the vehicle’s ride height and handling characteristics. Of course, “riding on a cloud” does have its shortcomings. 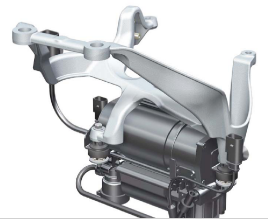 Air suspension suffers from higher rates of failure versus more conventional forms of vehicle suspension. This is especially true in the UAE where our many speed bumps and harsh climate greatly reduces the lifespan of these systems. The purpose of any suspension system in a car is to provide a comfortable ride, good handling, roadholding, braking, and to keep the wheels in contact with the road. 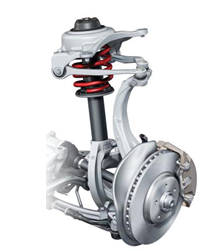 In a conventional suspension system, a steel coil spring is coupled with an oil filled shock absorber. The coil spring’s job is to elastically absorb impacts and it is responsible for maintaining the vehicle’s ride height. The shock absorber controls spring motions and prevents oscillation. 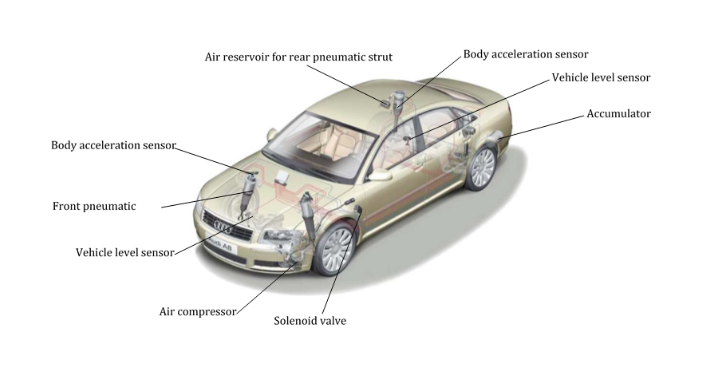 Air suspension systems are typically made up of four pneumatic struts, an air compressor, a solenoid valve block, an accumulator tank, and air lines that connect these components together. In Mercedes systems, there are pressure sensors in each strut whereas Audi systems have a central pressure sensor located in the valve block. 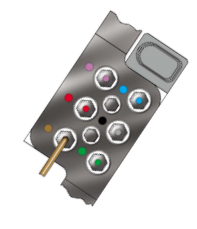 A series of body level and acceleration sensors feed information into a control module that in turn instructs the accumulator, compressor, and valve block to move air around accordingly. 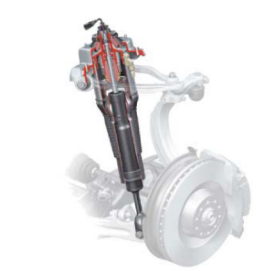 The air suspension strut is made up of an air spring that acts as the coil spring and a solenoid which provides the dampening effect by magnetically resisting the linear motion of the piston. The air spring is comprised of a pressurized rubber bag or “U-bellow” surrounding a cylinder-piston setup. In order to enhance durability, the bellow is made up of polyamide cord woven inserts surrounding an elastomer (i.e. rubber) that ensures the bellow remains air-tight. In order to improve the response behavior to external forces such as those encountered during cornering or while driving over bumpy roads, the bellows are often encased in an aluminum cylinder. Some air suspension struts have an air reservoir attached to the air spring in order to have a sufficient volume of air necessary to satisfy comfort requirements without increasing the diameter of the strut. This is often done in the rear struts of Audi vehicles in order to maintain a large boot space. The air compressor runs off of the battery and is responsible for building and maintaining air pressure in the struts and the accumulator. In the event of an air leak, the air compressor will attempt to restore air pressure by powering itself on. In order to avoid causing damage to the compressor from running for extended periods of time, the compressor will automatically shut off before it begins to overheat. Unfortunately, this failsafe does not always ensure the safety of the pump, especially if a leak is not repaired and exists for an extended period of time. The solenoid valve block directs air from the compressor to the struts and to and from the accumulator. The unit has six air line connections; an airline connected to the compressor, four that send pressure to each of the four struts, and one connected to the accumulator. The accumulator tank maintains a high operating pressure of about 16 bar. 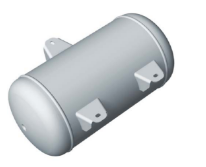 In order to use the compressor sparingly and keep energy consumption low, the accumulator tank maintains a high pressure that feeds the system. Generally, there must be a minimum pressure differential of 3 bar between the accumulator and the struts in order to build-up pressure in the struts. 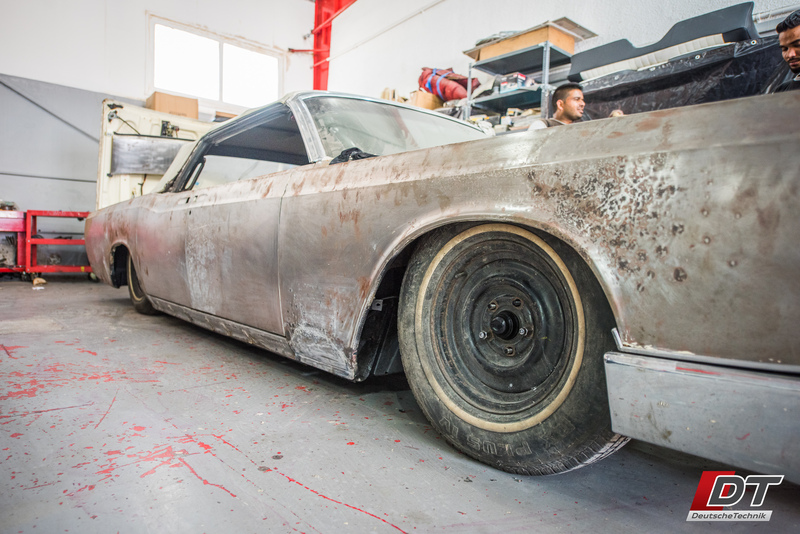 c) Why do air suspension systems fail so often in the UAE? The reason air suspension systems fail more often in the UAE is due to the many speed bumps, hot climate, and the high amount of particulates floating around in our air. The speed bumps cause cars to brake often, which stresses the struts, and the speed bumps themselves strain and wear out the air struts. The high temperatures dry out rubber and plastic causing these materials to become brittle. This means that the bellows, gaskets, and bushings become more fragile more quickly. The humidity and high particulate count serve to put additional stress on the compressor, its intake filter and the air dryers that follow the compression chamber. The most common cause of air suspension failures is a leak in one of the front suspension struts, specifically the bellows. The reason the front struts are more likely to fail than the rears is because the majority of a car’s weight distribution is at the front. Often, when one front strut fails and is no longer suspending the car, the adjacent strut quickly follows suit due to the added weight it now has to deal with. The second most common failure occurs in the compressor. Intake air first moves through a filter intended to remove any particulates in the air, then directly into the compressing chamber where a piston forces the air into a smaller volume. The compressed air then moves through the air dryers before it is sent to the struts and accumulator. This means that in the humid environment of the UAE, the compressor is exposed to a high amount of condensed water which serves to accelerate wear on the parts that make up the compressor. Another factor that decreases the lifespan of these compressors is the fine particulates that tend to linger in our air due to the high temperatures and humidity. These particulates deteriorate the intake filter over time and a small fraction of these particulates make it through, hastening the wear of the compressor. The next most common failure is the valve block. The valve block is made of several one-way and two-way valves that receive and send air from and throughout the system. The UAE’s high temperatures do serve to cause additional wear on the valve block, but not to a significant degree, it is simply a vulnerable part of the system. Air suspension systems are powered by the car’s battery and are therefore integrated into the vehicle’s electrical system. Electrical faults in the vehicle can sometimes cause problems with the air suspension system. This is where diagnostic software coupled with electrical diagnostic methods work in tandem to pinpoint the root cause of the faults. Where other workshops will start replacing expensive components, Deutsche Technik can find inexpensive electrical and computer programming related solutions. At DT, we have two dedicated diagnostic software and electrical specialists. They are formally educated in the electrical field of automotive with over ten years of diagnostic software experience each. It would be nice if air suspension systems are as trouble free as Aladdin’s magic carpet, but the fact is air suspension systems are a complicated technology that few repair shops in Dubai are properly equipped to repair. At Deutsche Technik, we pride ourselves on making complicated repairs easy by employing knowledgeable and experienced staff and equipping ourselves with the latest diagnostic tools. We hope this page has given you a good understanding of how air suspension works so that you can make informed decisions regarding the repair of your car’s air suspension system in the future.